Some of the Rangers Family may remember nearly a year ago I collected donations for an "Ibrox Murals" project I'd been speaking to the club about. However shortly afterwards the club went into administration, and unfortunately due other more pressing matters, it was all but forgotten about. But since that time I have been trying to construct a plan of what best to do with the donations, and after speaking with the various fan groups have come up with the project, "Painting Our History". 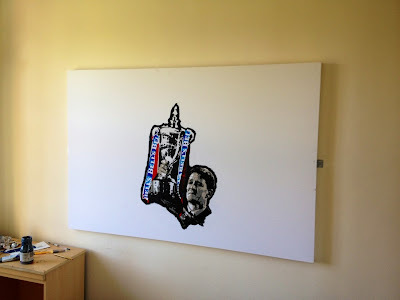 The plan for the project is to paint massive 15 sq ft canvasses depicting our club's greatest moments: 9 in a row, Barca '72, Souness Era etc… and donate the finished pieces to the Club - on the condition they are displayed in a prominent area for the fans to enjoy, such as within the Ibrox concourses. I can't obviously promise that the Club will accept this gesture, however I have a relatively good relationship with them, and in April '12 donated a painting to Rangers which was auctioned to raise £2800. I have spoken with all the major forums (Rangers Media, Follow Follow & GersNet) and all have offered their support in backing the project as well as the Trust. I hope that this project will generate a great buzz amongst the fans, and really stick it to anyone who says our history is not intact. So I hope to have all of your support, as that's what will make the hard work worth while. And please feel free to send over any iconic images you think would make a good addition to the project!